AVI is typically less compressed video container that can be encoded with a variety of video and audio codecs. Therefore, although AVI is in Samsung TV supported video format list, you can’t play AVI on Samsung TV from time to time. Normally, if you can’t play AVI on Samsung TV and you have checked that the connection was fine, the major reason will be the AVI codec that is not supported by Samsung TV. However, as a video container, AVI can be DivX AVI, XviD AVI,MPEG-4 AVC AVI, MPEG-2 AVI，NewTek SHQ3 (4:2:2:4) codec AVI, etc. Especially, if your AVI videos are some recorded video files by some screen capture software, the AVI files are likely encoded with some rare video codecs that are not supported by Samsung TV. Anyway, when your AVI is not supported by Samsung TV, you can try to convert AVI to Samsung TV supported AVI or other more compatible MP4 video with video converter. Pavtube Video Converter Ultimate will be your best choice to convert any AVI to Samsung TV supported H.264, DivX, XviD AVI, keeping high video quality. You can adjust your AVI video and audio codec, bitrate, resolution, channel to adapt to your Samsung LED TV, 4K SUHD TV display. You also can adjust display aspect ratio and deinterlacing video to get better AVI playback on Samsung HD TV. 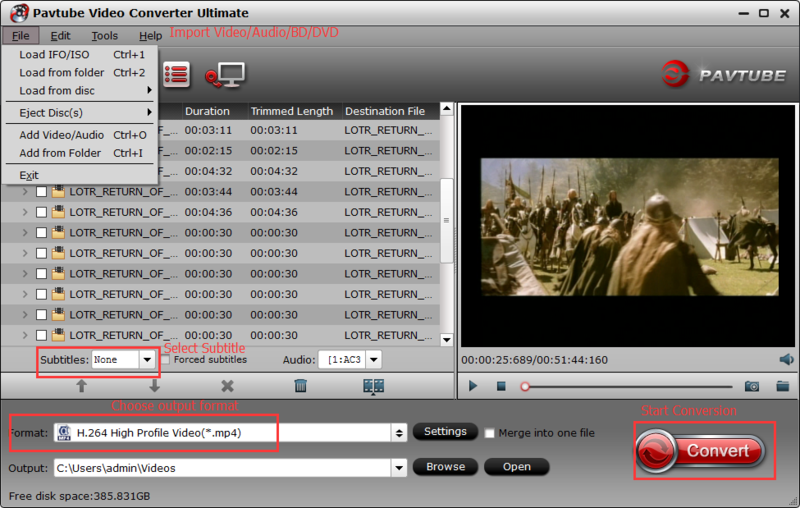 Once you have added AVI files to the queue (the “drag and drop” method is supported), you can view their thumbnail and total time, as well as preview the video with the right media player. A task can take a while to complete (even in the case of small files and default settings), but that’s because Pavtube Video Converter focuses on maintaining a good image and sound quality (which it accomplishes). The program also has well-explained how-to tutorials and an intro video. Just download and install the AVI to Samsung TV converter and launch it. You can load the AVI files by browser or just drag and drop the AVI to the software. This program supports batch conversion so you can load multiple AVIs to batch them. 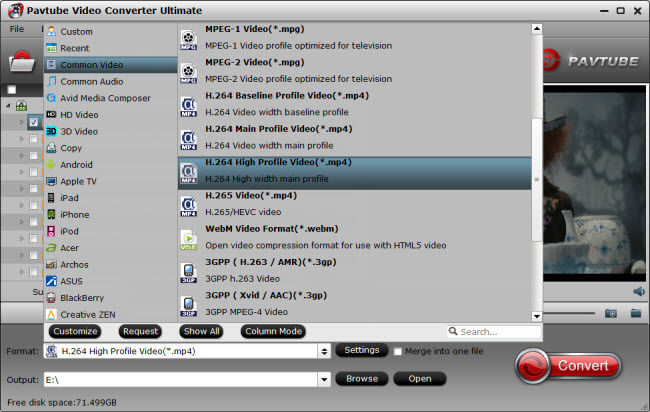 If you are using a Mac, you should use the equivalent Pavtube iMedia Converter for Mac. Click “Format” and navigate to “TVS” profile. Here lists the main four TV brands. Just choose Samsung TV. Or you can also select common H.264 MP4 format in “Common Video” or HD MP4 from “HD Video” so that you can use the video in other portable device. You can click “Settings” to check if the video is H.264 video codec and AAC audio codec. In the profile settings window, you also can change the resolution, frame rate, bitrate to fit in your Samsung TV. After the above steps are done, you can click “Convert” button to convert your AVI to Samsung TV. Once the process ends, you can find the generated Samsung TV supported AVI video in the output folder. You can transfer the converted AVI video to USB stick then stream it on Samsung TV via the USB port. You also can put the file into Plex sharing folder then watch the converted AVI video on Samsung TV with Plex. If you want to play the video directly from computer to Samsung TV, you can use audio-visual (AV) cables to connect the computer and TV. Samsung TV not Playing MKV Files? Solved!